Thermostatic control for thermostatic valves. Liquid sensor. Regulatory limitation system; locking system to a desired value. 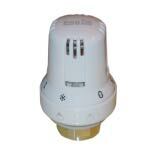 Fil.28 P.1.5 Thermostatic valves are plated nickel brass made.